Vintage - Mayfair Fine Bone China of Staffordshire, England, Chrysanthemum Pattern, Circa 1930's. 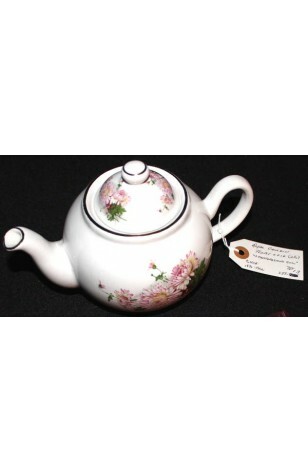 A wonderful Tea Pot and Lid made by the Mayfair Fine Bone China Co. of Staffordshire, England. A Lovely White Tea Pot & Lid, with Pink and Yellow Chrysanthemums, and Greenery. Colors are Pale, yet make a Stand Out Tea Pot that is Trimmed in 22kt Gold. The Tea Pot shows some light crazing, very normal for its Vintage 1930's age. Otherwise in good condition. A wonderful Tea Pot and Lid made by the Mayfair Fine Bone China Co. of Staffordshire, England. A Lovely White Tea Pot & Lid, with Pink and Yellow Chrysanthemums, and Greenery. Colors are Pale, yet make a Stand Out Tea Pot that is Trimmed in 22kt Gold. The Tea Pot shows some light crazing, very normal for its Vintage 1930's age. Otherwise in Good Resale Condition unless noted below or in pictures.